Rhubarb is well-documented as one of my most favourite things, so when I saw a photo of those pretty pink stalks on my local greengrocers' Twitter (yes, I realise that sentence is a bit ridiculous...) I had to grab some immediately. Like my other favourite food season, British asparagus season, the time for Yorkshire rhubarb is too short for my liking, so I'm intending to make the very most of it whilst I can. Starting with these rhubarb and orange muffins from Signe Johansen's 'How to Hygge', whipped up for me to enjoy for breakfasts all this week. And this is just the beginning of my rhubarb baking, with these blondies firmly on my list, and Harry Style's Dutch Baby from Ruby Tandoh's Flavour for starters. I'd love any other rhubarb recipes you've got up your sleeves! A note on 'How to Hygge'; I know that some people are getting a bit fatigued by the hygge trend but I am certainly not one of them. It's not so much a trend, as a way of life, and I love the philosophy on food (and Nordic life) that Signe lays out in her book: 'work efficiently, be active, eat what you love, and make the most of those convival moments of downtime during the day'. I need to work on the active part, but I definitely have the eat what you love part down. 'How to Hygge' is more of a lifestyle book that covers a wh0le array of 'hyggelig' things, but there's a big section of beautifully shot recipes right in the centre, ranging from Scandi salads and morning porridges to comforting bakes like these muffins, perfect for enjoying a little 'Fika' - a moment in your day to switch off, enjoy the company of your friends or colleagues, and tuck into a slice of cake and a cup of coffee. I tell you, those Nordic folk have got it right. The zingy rhubarb and orange in these muffins make them feel surprisingly light and summery, whilst still having that comforting carby-ness that you need on winter days. When it's dreary outside, I'm pretty sure these will bring you a spot of sunshine to your day. And if you're looking for a lovely present for a friend, this book would be perfect! Preheat the oven to 180C and line a 12 hole muffin tin with muffin cases. Place a shallow tray with water on a lower shelf in the oven. Place the rhubarb in a bowl and mix with the zest and juice of one orange, and a spoonful or two of sugar. Stir to coat the rhubarb. Sieve all the dry ingredients into a separate bowl and and stir through so the raising agents are evenly distributed. Stir in the zest of the other orange. Make a well in the middle and add all the wet ingredients. Stir the mixture in a figure-of-eight pattern, making sure the scoop up the dry bits around the edges of the bowl. After about a dozen stirs, add the rhubarb, along with some of the juices from the bowl for extra flavour. Stir the rhubarb through a few times and then use a large spoon to dollop the mixture into the muffin cases. Bake on the middle shelf for 20 minutes, or until the muffins have risen, look golden brown and feel firm to the touch. In summer, I am all about the seasonal produce. I cannot get enough of salad, berries, fresh fruits and delicious produce. I pile my basket high at the greengrocers, and can barely get through it all, such is my greed and excitement. In winter, however? Not so much. I'm not saying that root vegetables are boring but... well, that is what I'm saying. It's just so much harder to get excited about a carrot than it is a strawberry or raspberry. Maybe it's because so much 'seasonal' produce in winter is actually available, and pretty tasty, all year around. There's not much difference between a carrot in January and a carrot in June. There are exceptions to the rule, of course, and it's those that get me excited to go into the kitchen during winter and make up something new. Before Christmas, pomegranates were my jam and I was putting those delicious seeds onto everything in sight. Now? It's blood oranges. They are just the most beautiful colour, and they could not be tastier than they are right now. There's something about their limited availability that makes them that much more appealing - as in dating, as in the kitchen in this instance. Is this paragraph getting weird? I'm okay with it. When my love affair with blood oranges ends, it will be time to get re-acquainted with the beauty of rhubarb, but until them I am making the most of these zingy little fruits and everything you can do with them. This salad is a true thing of beauty. It's got the freshness and the rich flavour of the blood orange, the subtle creaminess of the mozzarella, the saltiness of the proscuitto and the pepperiness of the rocket. It's basically a flavour party in your mouth and everyone's invited. I'm not usually one for chowing down on salads during the winter - I am all about making the most of comfort food during the cold season - but this is most definitely worth getting a little bit healthy for. It's my little January present to you. Using a knife, remove the skin from the blood orange and slice thickly. 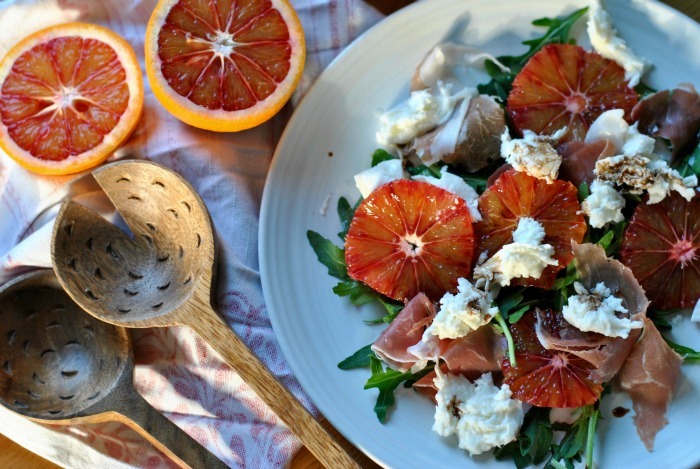 Place the rocket on a plate, and scatter over strips of proscuitto and slices of blood orange. Tear over the mozzarella. Drizzle over a light splash of olive oil and balsamic vinegar.